Best Cheap Recommended eCommerce Hosting - How to Install WooCommerce ? 2. Go to Plugin > Add New. In the search box, type ‘woocommerce’ and click the button Search Plugins. 3. After that it will go to the results page, look for Woocommerce – excelling eCommerce . Simply click the Install Now option. 4. On the pop-up, click OK to continue the installation, otherwise it will not proceed. 5. Once the installation is complete, activate the plugin by clicking on the Activate link. This method requires downloading the plugin source files from the official WooCommerce site. 1. First, Download your WooCommerce plugin to your desktop. 3. With your SFTP program, upload the Plugin folder to the wp-content/plugins folder in your WordPress directory online. 4. 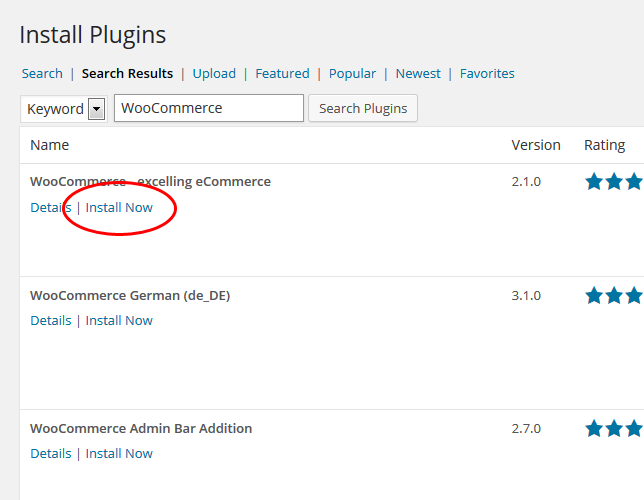 Log in to the WordPress dashboard, go to the Plugins screen and find the newly uploaded WooCommerce plugin in the list. 5. Click Activate Plugin to activate it. HostForLIFE.eu has great experience in providing excellent WooCommerce hosting support for their many happy customers. Whatever your budget, WooCommerce Hosting with HostForLIFE.eu means reliable hosting. You will enjoy the full support of the experienced HostForLIFE.eu team, 24 hours a day, 7 days a week. Affordable Budget prices, full features, 99.9% Uptime Guarantee, No Risk with 30 day Money-Back Guarantee for WooCommerce Hosting! HostForLIFE revolutionized hosting with Plesk Control Panel, a Web-based interface that provides customers with 24x7 access to their server and site configuration tools. Some other hosting providers manually execute configuration requests, which can take days. Plesk completes requests in seconds. It is included free with each hosting account. Renowned for its comprehensive functionality - beyond other hosting control panels - and ease of use, Plesk Control Panel is available only to HostForLIFE's customers.